Imagine you are moving to a new world, leaving behind everything you know and love for life in an unknown country. If possible, you’d probably want to bring along favorite foods and most-used medicines. What would those be for you? Tomatoes? Pumpkins? Antibiotics? Dandelions? Four hundred years ago, Europeans were making those same big decisions as they left all they knew behind for life in the “new world.” Some couldn’t bear to leave their favorite plants and so they intentionally brought seeds to plant in their new home. It’s ironic to me that dandelions were once so cherished that people intentionally brought them across the ocean so they would not be separated from them. But then fast forward a few hundred years later and now many people in North America poison dandelion with chemicals to discourage its abundance in their pure grass lawns. Strange how things turn out, huh? Luckily, many of us are waking up to the generosity of this bountiful plant. Every part of the plant can be used as food and as medicine. It is an effective medicine for many conditions, yet safe for practically everyone to use. The best news is that it probably grows abundantly near you, making it accessible and cheap, too! But this recipe isn’t about the amazing virtues of dandelion. It’s not about how nutritious dandelion is or about how it can be used as a powerful medicine. No, this recipe is all about junk food. Wild food junk food. Okay, okay, as far as “junk” goes, this is actually pretty healthy and still very tasty. But you won’t be thinking of that as you pop these crispy fritters into your mouth. 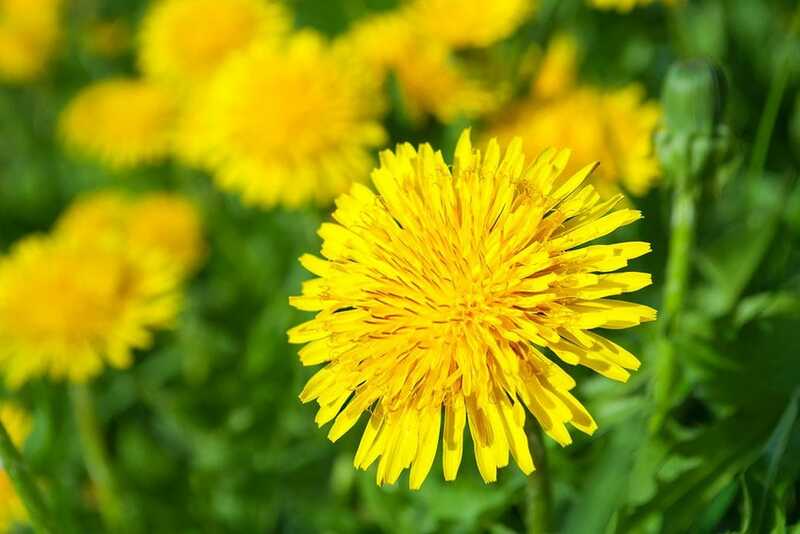 Before we get to our dandelion fritters recipe here are a few tips for identifying and harvesting dandelion flowers. You are probably familiar with dandelion flowers. The yellow inflorescence can carpet lawns in the spring (a welcome sight from the repetitive green, if you ask me). However, there are a few other plants out there that resemble dandelion. There are a few ways to tell true dandelions from other plants. First, dandelion leaves are completely smooth without any coarse hairs. Another way to ensure you have the right plant is that each flower is attached to one stalk (as opposed to many flowers coming from one stalk). Hawkweed (Hieracium spp.) is often mistaken for dandelion. The flowers do look very similar but the big difference is the many flowers per one stalk. Here are my tips for harvesting the best dandelion flowers for your fritters. Harvest in an area that has not been sprayed with chemicals. Also look for an area not frequented by dogs and cats. Make sure you are 100% positive you are harvesting dandelion flowers. Harvest flowers in the later morning to early afternoon on a sunny day when the flowers are fully open. The best flowers look vibrant, not discolored, old or limp. They should be free of dew. Use the flowers immediately after harvesting. If you store them in the fridge they will close up. If you dry them they will go to seed. The red circles show the bracts which need to be removed before eating. This recipe has two variations: sweet or savory. But really the possibilities are endless! For sweet: add 1 tablespoon of honey (or to taste) plus 1/2 teaspoon to 2 teaspoons total of the following herbs: cinnamon, cloves, cardamom, nutmeg. For savory: add a pinch of thyme, rosemary, oregano or other savory herbs. You may also want to add another dash of salt. Mix the dry ingredients together and then add the egg. Combine well. Add the sweet or savory ingredients. Dip the flower blossoms into the batter, coating both sides. Once well-coated, fry in hot oil until golden brown. Place the fried fritters on a plate lined with a paper towel. Let cool slightly, then enjoy!